The resident population of Avalon, the one town of which the island boasts, is not much over one hundred; but during the months of summer people gather there in thousands. On special occasions two, and sometimes three, steamers are pressed into service to accom­modate the crowds of pleasure-seekers. At other times one, steamer alone plies back and forth daily, and it not infrequently happened, before the inauguration of the messenger ­service, that a community of from 4,000 to 6,000 people was without means of communica­tion with the mainland, which is plainly visible not twenty miles distant, for twelve and even thirty hours at a time. To be sure, in cases of emergency a power­ launch or yacht might be brought into requisi­tion, but four or five hours at the least would be consumed in making the trip across the channel; while in riotous weather few would care to hazard it. Thus for many years this semi-isolation from the world at large continued. Then something happened. 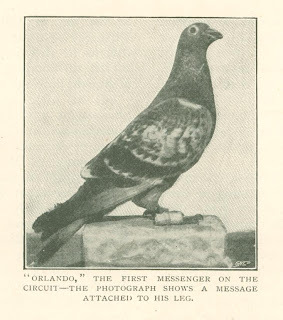 It began with an item in a local paper to the effect that a messenger-service of carrier-pigeons was to be established between Los Angeles and Avalon. The announcement was received with the unspoken comment which such a palpable canard deserved. 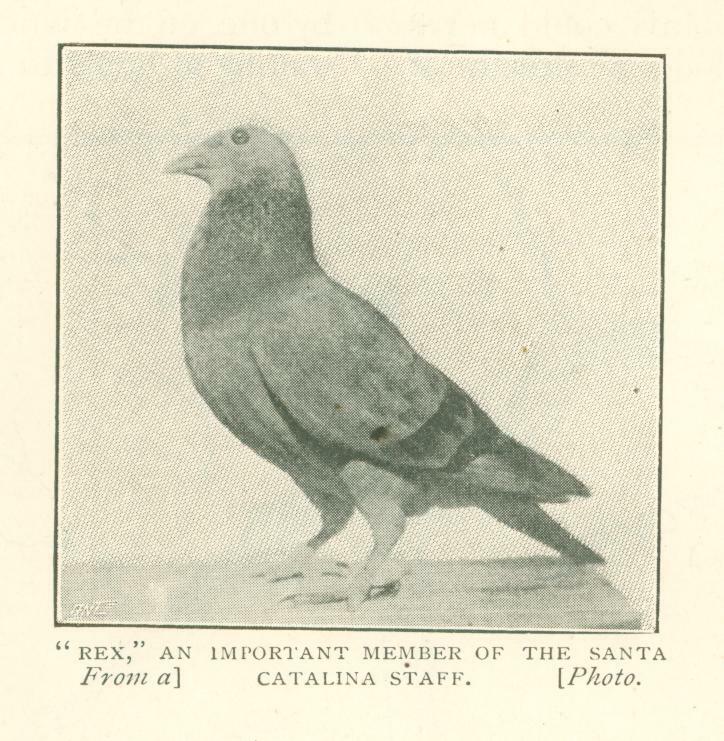 Later the rumor materialized, and it was presently learned beyond a doubt that two young pigeon-fanciers in Los Angeles were actually preparing to embark in such an enterprise. At this a howl of derision went up on all sides, and the ignorance of the masses as to the limitations of the intelligent homer was made manifest. It was declared that land-birds could never be trained to fly over so long a stretch of water; that the messengers would be maimed or killed outright by pot-hunters or other "birds of prey"; in short, the most absurd prophecies of failure were heard on every side. The concensus of opinion, however, more or less conservative, seemed to be that while an occasional bird might reach the home loft with the message intact, it would be impossible to place any dependence upon a service of this kind. Undisturbed, however, by adverse. comment, the boys proceeded with the training of their birds. This is accomplished, as the reader may not know, by conveying the birds a short distance away and then liberating them, when they demonstrate their home-loving qualities by speeding rapidly to the place where they dwell. A day or two later the same birds are taken on another and longer expedition and again liberated. This process is repeated at short intervals, increasing the distance each time, until a bird will fly without fail from the desired point of communication direct to its own perch and nest-box. When the important day arrived for dispatch­ing the first message across the sea excitement on the island was intense. Even" Mexican Joe," who had figured in all the stirring events on Catalina Island for nearly half a century, declared that the people were" tad as locos" (all crazy). A message written on a bit of tissue-paper by one of the fanciers to his brother, who was waiting at home to receive it, was duly attached to the leg of Orlando, a high-class homer. Then the bird was released. Every eye followed him as he flew, now skimming along the tops . of the surrounding hills, and then darting in a straight line far up the canyons. All at once he disappeared. A look of amusement appeared on the faces of the incredulous crowd, and this was followed by a shout of laughter when somebody discovered the delinquent Mercury quietly reposing on the pent-roof of the hotel. The merriment was short-lived, however, for Orlando suddenly darted upward. He circled round and round, going higher and higher with each revolution until he became a mere speck in the blue vault above. Then he was seen to shoot off in a direct line for Los Angeles and home. 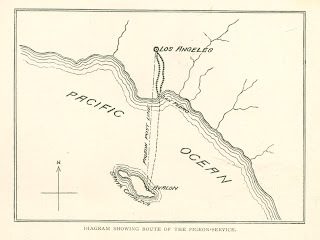 The air-line distance from Avalon to Los Angeles is about fifty miles. The time required by the human animal to make the trip via boat and train is from four to five hours. Orlando accomplished the distance in precisely fifty-four minutes. 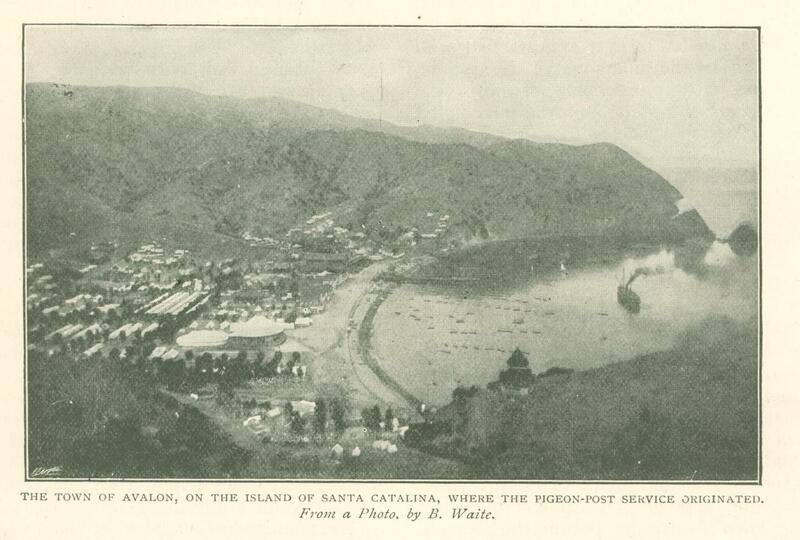 The best time made by any of the Catalina carriers is fifty minutes. One hour and fifteen minutes was found to be an average rate of speed. Numerous experiments in preparing and attaching the messages were made. The method now in use is to write the message on tissue-paper, of which a size about three by four inches with suitable im­print is preferred. Then the paper is rolled up into a tight little drum-shaped pellet, inserted in a tiny celluloid tube, and secured with a bit of fine wire to the ring on the bird's leg. The ring is an adornment which well bred homers alone affect. It is made of brass, German-silver, or aluminum, and bears the initials of the owner of the bird together with certain cabalistic figures known only to the flying fraternity. 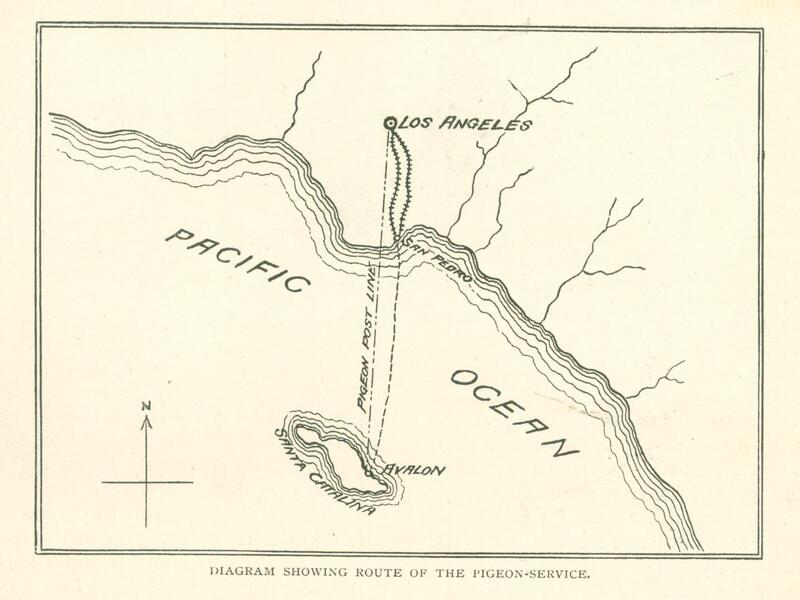 For several years now the birds have been flown between Avalon and Los Angeles during the Summer months, and their reliability and promptitude have been a revelation even to those persons having some knowledge of the homer's accomplishments. The mishaps and failures to connect on the part of the dispatch­ bearers can be counted on the fingers of one hand. One sultry afternoon a trio of birds were duly equipped for the journey, and upon being liberated circled about for a few minutes in their usual way, and then, in­stead of starting off across the channel, veered about suddenly and returned to their loft on the wharf. There they remained until the following morning at daylight, when they rose together and sped rapidly homeward. It was learned later that a thunderstorm was in progress in the vicinity of Los Angeles at the time, and the birds, alarmed at such a rare phenomenon, were afraid to venture. On one occasion a certain bird failed to deliver his message, and it was learned subse­quently that he had been shot in a wheatfield by a farmer. The man was ignorant of the importance of his victim until he discovered the ring on its leg. Again, one bird came in a day behind time with a gun-shot wound in the wing, and its career as a messenger was brought to an end. One summer two valuable messengers failed to arrive at a given time, and whether they were shot, pursued to the death by hawks, or whether they willfully deserted the ranks is not known. An instance of failure occurred in the case of a female bird which, in the height of the busy season, deliberately took a two weeks vaca­tion. At the end of that time she returned home, and proceeded to engage in a desperate encounter with another bird of the possession of her former nest-box. Such shift­lessness could not be overlooked, so the truant messenger was promptly taken off the circuit and put on the" retired list." Some malicious person trapped a certain bird and clipped its wings. When the feathers grew out again the bird made straight for its home loft. The advantages of the pigeon - post were highly appreciated, as may be imagined, by those who had heretofore been sub­jected to annoying and not infrequently serious delays. "Good gracious!" some feminine voice would ex­claim, "you don't mean to tell me the boat has gone? And I never thought to send over for 'The Martyr Wife; or, Love in a Pillory' - it's the latest sensation, you know, and I'm just dying to read it." Or perhaps a Napoleon of finance, in whose mathematical brain the wheels for once had refused to go round, was heard to declare that he would give 5oodols. if he could send a dispatch from Avalon to Los Angeles. While the departing steamer was almost within hailing distance of the hotel porch, and handkerchiefs were fluttering from its decks like a Monday's washing in a northerly gale, an agonizing cry of "No lemons!" would issue from the lips of a scared faced pantry boy. And happy indeed the day if this discovery were not supplemented by the more appalling one that there wasn't a lemon to be had from one end of the island to the other. 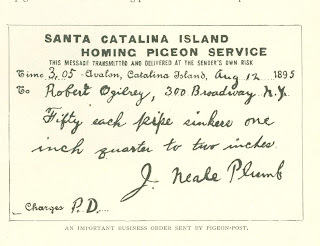 The financial result of the carrier-pigeon ser­vice is by no means un­important. The managers arrange with a Los Angeles paper to forward the news of the day prepared by a special correspondent, for which a fair remuneration is received. 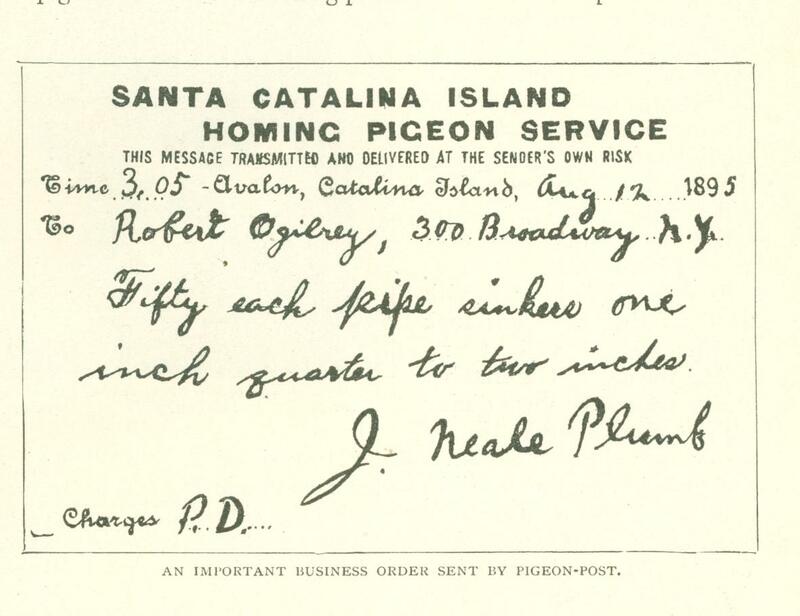 Private messages, business orders, etc., are forwarded at prices varying from 50 cents to $1.50. 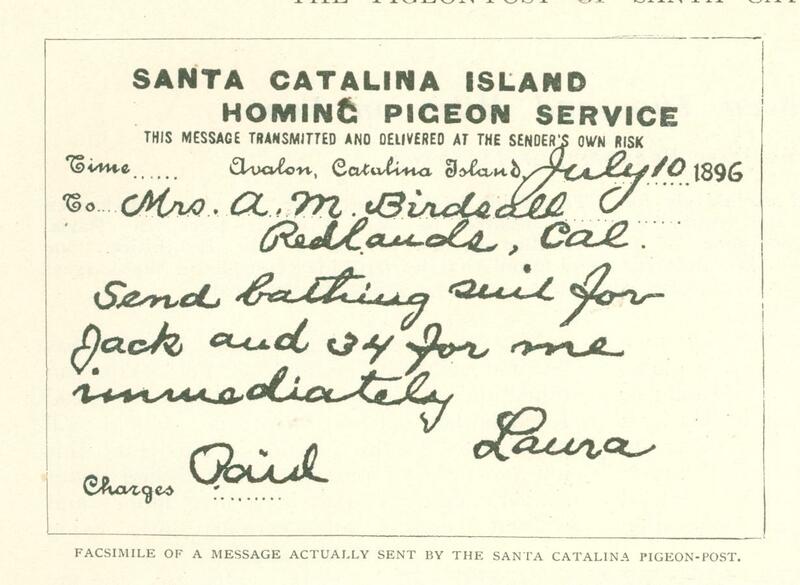 Flying the birds from Cata­lina to Los Angeles proved so successful that the boys established a loft on Catalina, thus being able to fly birds both ways and materially in­creasing their income. 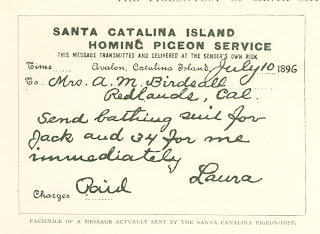 Among the many instances which might be related of the Catalina messengers, illustrat­ing the possession of those remarkable home -loving qualities which make the carrier-pigeon valuable as a bearer of dispatches, the experience of one important member of the feathered force is well worth recording, At the close of the '96 season Clara W. - a red­ checker hen, thirteen months old, was trained with other birds to fly from Salton, Arizona, to Los Angeles, a distance of 144 miles. A few weeks later she was sold to a fancier at Tucson, 300 miles farther away, and duly shipped to her new home. One morning she was dis­covered in the old loft at Los Angeles. In accomplishing her 450 -mile journey the intrepid carrier had flown across a treacherous desert in a drizzling rain, covering in her wonderful flight more than 300 miles of absolutely unknown territory. It would seem that after such an heroic effort the indomitable Clara might have been allowed to remain in the home of her birth and prefer­ence, but the very next train for Arizona bore the sad-eyed, wing-clipped little traveler back to the abiding-place a cruel fate had provided.